Robustly designed for high capacity crushing (200-1500 TPH ) of ROM coal and similar friable materials. Unique crushing action with higher reduction ratio and lower power consumption. Large freed size relative to motor diameter. Easy gap adjusting arrangement between the cage & ring hammers to compensate wear for maintaining product size. Low maintenance cost & long service life. 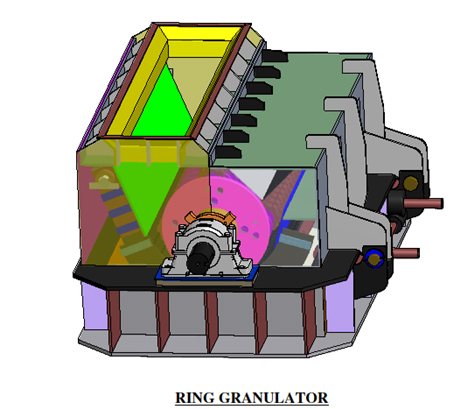 The SISCO Ring Granulator is fabricated from heavy steel plate dully stress relieved. High tensible forged alloy steel shaft. Statically/Dynamically balanced motor to smooth rotation with minimum vibration & noise. Wear out components like crushing ring, breaker Plate, Cage bars & others are rugged & made of abrasion resistance steel. Heavy duty self aligned spherical double row bearing with splited cast steel housing. Grease lubrication accompanied with dust resistance seal.